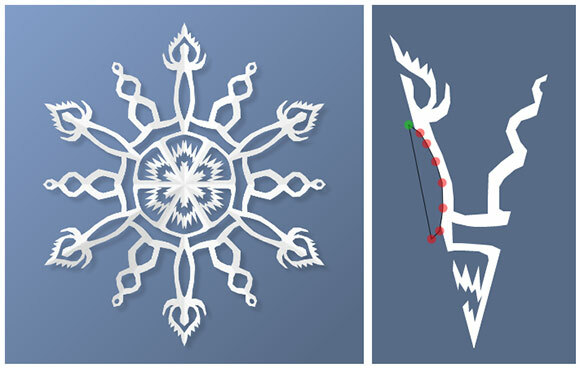 Paper Snowflake Maker – Create, save, and share snowflakes with this HTML5 Canvas app. The application is intended to recreate the craft of paper snowflake making, where the paper is folded properly to create six-fold symmetry. Clicks with a mouse replace scissor cuts (see the instructions at the bottom of the app). The intent of the design was to allow only straight-line cuts, but after playing with this for a while I’ve decided some freehand cuts might also be nice. Perhaps those will be included in a future version! Here is a small flickr set containing a few images created with this application. If you are interested in knowing more about the code for this application, I will be posting more articles to this blog soon. For now, you can certainly view the source within your browser. Have fun with the application and let me know if you encounter any issues. The code for sharing images on Facebook came from combining elements from this github gist from Andy Burke, this post at coderwall, and some of the source files distributed through this Coursera course. My thanks to Mario Klingemann for his StackBlur for HTML5 canvas, which I used to draw the drop shadow underneath the snowflake. (I know the HTML5 canvas has some built-in methods for drawing shadows, but there is currently an issue in Chrome which causes some inconsistency). So cool! But the “sharing your snowflake on fb” option isn’t working for me. It gives me a “user login problem!” error. Thanks for letting me know. I guess more testing of that code is needed. It is working for me here, but I’ll look into this some more. Really cool man! Saw your post on reddit (I don’t have an account). I am trying to learn web development and stuff like this inspires me. Thanks for your comments! Glad you like it. (Sorry I didn’t see your comment for a while…I was busy with some things.) I’m working on a blog post now that will explain some of the code behind this application. I hope you’ll find it instructive! Is there any possibility of your adding a tool for making better curves? Thanks! This is a fun thing to play with. Glad you like it! Yes, I think I should probably add some more curve-drawing options when I can. The original idea was to make the cut lines straight like scissor cuts, but I suppose you can also cut curved lines with scissors. And it would be a fun option, so I should add it. I too would love you to include curves.. draw with a pen? I would use this program to make Hawaiian quilts. Sorry for the slow response! Thank you for your comment. Curves might be a nice idea for a future update. Glad you’re enjoying it! Sorry for any loss of productivity. So cool. Makes me consider what the equivalent one dimension up would be. Perhaps rotating a 3d cutout object in euclidean 4-space about a 2D plane to get a symmetric object in 3-space. Glad you’re enjoying it! It sounds like you’re going two dimensions up in your thinking. Going up one dimension would produce a 3d solid from some transformed solid. The symmetries might be reflections over planes, but there could also be rotations. There are a lot of interesting symmetry “groups” one could consider. Might be interesting to code someday! This is amazing! So easy that my elementary students are having a BLAST with it!! So many uses — symmetry, geometry, even multiplication (total number of cut-outs). So glad you could use it with your students! Very sorry I never responded – as you may have noticed I am not updating this blog frequently! You can grab the source code from your browser.